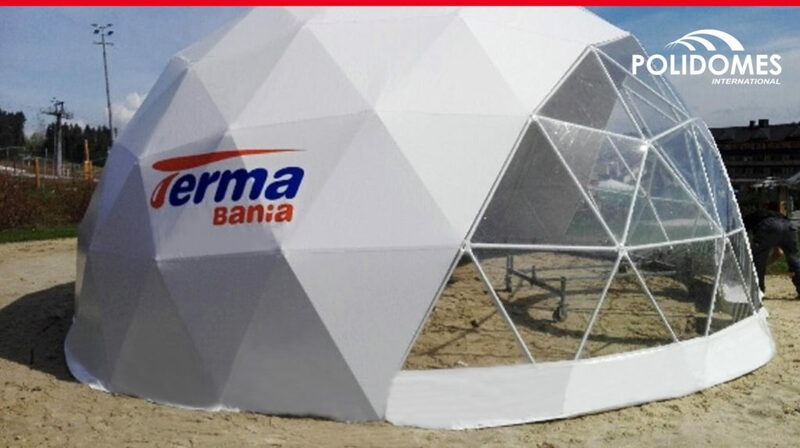 Branded geodesic domes with logo - an exclusive, sheltered space! At Polidomes International, we deliver our products around the globe – we aren’t afraid of high mountains or desert sands! 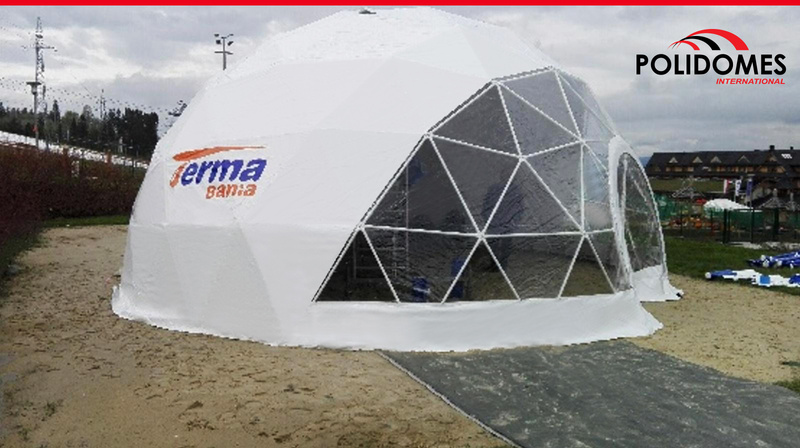 With our branded geodesic domes, we reach out wherever there is a need for a top-quality product. Recently, we had the pleasure of working with the Bania Water Park, located in picturesque Białka Tatrzańska. The idea of building a water park at the foot of the High Tatras mountains was born in 2006. From the outset, the guiding concept of the project was to fuse highland folklore with a modern style of entertainment. To that end, the facility was finished with environmentally-friendly stone and wood, giving the impression of a close communion with nature. The Bania Water Park is a large aquatic recreation complex, in operation since 2011. Its more than 400 m2 of recreation area offer numerous activities for guests of any age – the Wet Playground, Inflatable Water Playground and Water Slides are just a few! Beyond the recreational area, there are also on-site gastronomic facilities. 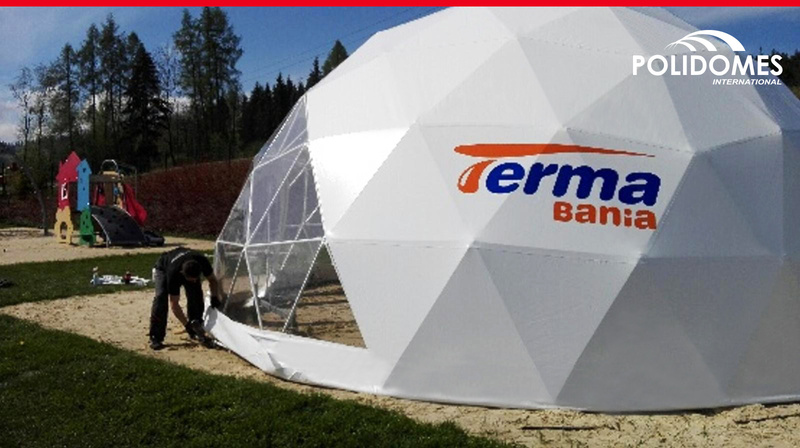 The restaurant area of the Bania Water Park makes use of a Polidome 50 spherical tent with a transparent front, thanks to which guests can enjoy elegant drinks prepared by the bartender while gazing at the natural beauty of the Tatras range. The transparent front works, of course, both ways – the exposed interior of the spherical tent encourages passing guests to stop by and take advantage of the cocktail bar’s wide range of spirits, cocktails and soft drinks. Many are surprised by the payment method at the facility – here again, folklore meets modernity. Bar tabs are set directly to your pool wristband, so there is no need to carry cash or cards with you. This convenient and practical solution allows you to focus only on what’s pleasant. The water park’s branded geodesic dome is anchored in the sand, which creates a festive climate and ensures a relaxed atmosphere, conducive to relaxation. When added to its tangible proximity to the mountains, even the most gloomy of guests can find his inner peace. The cocktail bar is located in the summer area of the water park, open only during the summer holiday season. At the end of the season and the closure of the summer area, the spherical tent can be easily disassembled, and reassembled when it’s time to open up again. Of course, repeatedly assembling and disassembling the branded geodesic dome does not affect its quality, as our products are made with the highest quality materials, ensuring they retain their durability and perfect appearance for years to come. 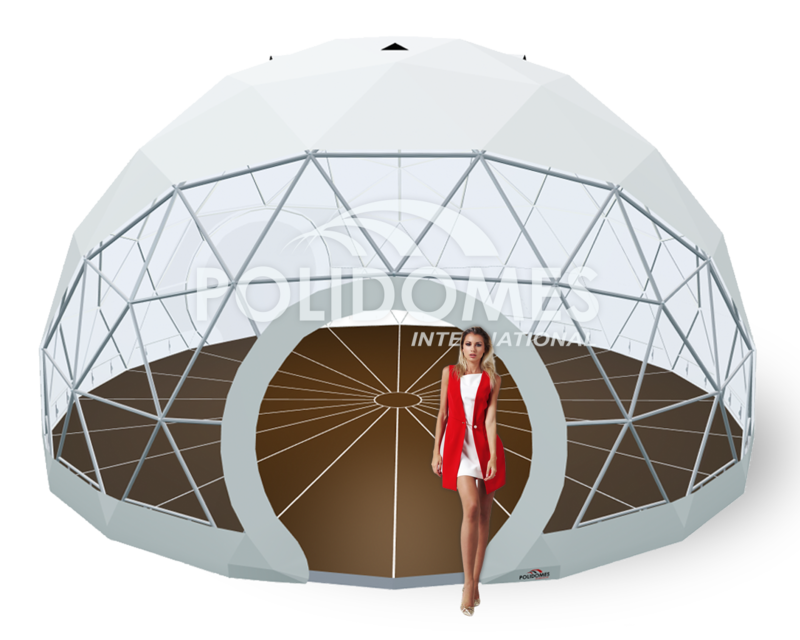 Thanks to rapid assembly and disassembly capability, Polidomes spherical tents are multi-purpose and highly versatile. Geodesic domes can be used in many different ways – in the summer as a bar, and out of season as an excellent form of advertising. Inside, you can also organize a promotional and information area, or a social space, play area, or disco. If you appreciate functional solutions, please contact one of our advisers, and we’ll be happy to help you pick out the best option for your needs!